HYDERABAD: Fluorosis, the scourge of Nalgonda, is now affecting the fourth generation of people in the region. Scores of school-going children have shown signs of dental fluorosis. If not taken care of, the kids will go on to suffer skeletal fluorosis and become crippled for life. Instances of neurological fluorosis are plenty in all age groups. For decades, politicians have harped on about tackling the problem but a ground reality check shows the problem has remained unchecked with the situation becoming frightening for children. “We thought she would die. She did not cry for at least 14 days in the hospital,” a woman in Bhatlapally village said. This village, in Marriguda mandal, is among the worst affected villages. The infant, Shyamala, cannot walk as she was born with what is believed to be neurological fluorosis. Battlapally has a a history. More than three decades ago, the entire village had been shifted to its current location from a nearby area. This was done because of the high content of fluoride in ground water which had been adversely affecting the villagers’ health. One of the villagers, Ramulu, is a symbol of how fluorosis can cripple a person. Both of Ramulu’s legs are bent sideways, which he said, made it difficult for him to walk. It is not just the elderly or middle-aged ones that are suddenly getting crippled. In Sahibadathanda, Priyanka, a teenager, stopped going to school a year ago. “I suddenly started falling when I tried to walk. And now I cannot walk at all,” Priyanka said. In the same village, 20-year-old Suvarna lies on a cot in her house. “One day, I suddenly realised I could not walk,” Suvarna said. Now she does some art works at home even as her parents hope that she will be fine one day. According to her parents, their son too was a victim of fluorosis and died after medical complications. In Kudhabakhpalli, the parents of three young girls, Manisha, Sirisha and Sindhu, are worried for their daughters as all of them are affected. Manisha, despite being unable to walk, has completed her degree. Her mother pleads that the government give her a job. Fluorosis Vimukthi Porata Samithi, an NGO, is working to identify and help fluorosis victims and to bring the victims’ suffering to the notice of the government. “Fluorosis is like slow poison. It kills you over time,” said K Subhash. 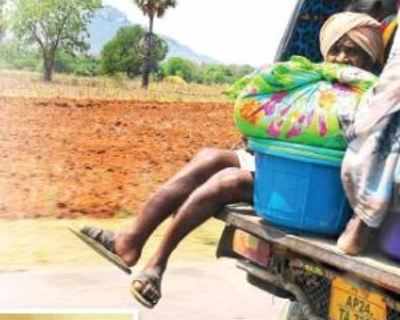 His aged mother is now bed-ridden, with fluorosis having affected her legs. . “The effects of having consumed water with fluoride content show up 12 years later,” he said explaining the large number of people who suffer from the condition in Nalgonda and the high rate of deaths. A survey that was undertaken with a dental check up found that in one particular government school, there were more than 30 children who showed signs of dental fluorosis on their teeth. NGOs have also been raising awareness about dealing with the condition. For instance, Fluorosis Vimukthi Porata Samithi’s Kalyan and Pavani visit the schools and habitations in the area and tell the affected children about the kind of diet to maintain. “All that the people of Nalgonda are asking for is clean and safe drinking water and that is not too much to ask for,” Subhash said.